With a series of self-driving vehicles and robots emerging on the market, it looks like your unwanted socks and toiletries will be delivered by machine next Xmas. Promising enhanced delivery speed and cost effectiveness, as well as a much reduced carbon footprint, self-driving robot technology is seeing fully autonomous and semi-autonomous vehicles hitting the roads in record numbers. One of the most recent, the Starship delivery robot, will even deliver your groceries, with the fully autonomous system capable of making trips of up to 30 minutes to bring you your turkey and sprouts. Yep, well that looks pretty Jetsons. We can definitely see George receiving his morning paper out of one of those. The thing is though, George and Co. were living in 2062, not 2015. But that's the cool part, Starship are rolling these systems out in the UK and US next year, with a fully-working model already cruising around parts of London. According to Starship, the robot is equipped with numerous cameras, a speaker system and is always connected to the Internet, meaning that any potential attacks on the robot will be recorded in full. Whether or not this would prevent gangs of A Clockwork Orange-style youths from taking its valuable cargo though remains to be seen. As one of the biggest online retailers in the world, Amazon of course is all over this sort of tech, with them recently trialing out the Amazon Prime Air. The Air, which is a fully autonomous drone, is capable of being loaded with a package and then fly it directly to someone's house within 30 minutes. Just think of the possibilities! Now you could order that box of 48 Cadbury Creme Eggs at 3 AM and be drunkenly tucking in by half past. Again, the size and weight of items that are deliverable will obviously be modest - you're not going to get a new 4K television flown in by one of these things - however this fully autonomous system would definitely have its uses. Not all of the advances in delivery tech are happening at the small end of the scale too. Freightliner, for example, recently unveiled the Freightliner Inspiration Truck, the world's first licensed autonomous commercial truck. So, if you're looking for a new oven from Santa next year, then it may well be delivered by one of these. The Inspiration Truck, when put into autonomous mode by the driver, is taken over by what Freightliner refer to as the Highway Pilot. The Highway Pilot is a series of sensors and computer hardware that links together with a sophisticated set of cameras and radar systems to allow the truck to drive itself. Lane stability, collision avoidance, speed control, braking and steering are all controlled autonomously. While obviously the Inspiration Truck is not a fully autonomous delivery system, it does show how the use of machines could help avoid accidents and make human lives easier. And, talking about making human lives easier, how about self-driving, robotic drug dealers? No, not those types of drugs, the good type, the type people need after having one too many Xmas sherries. 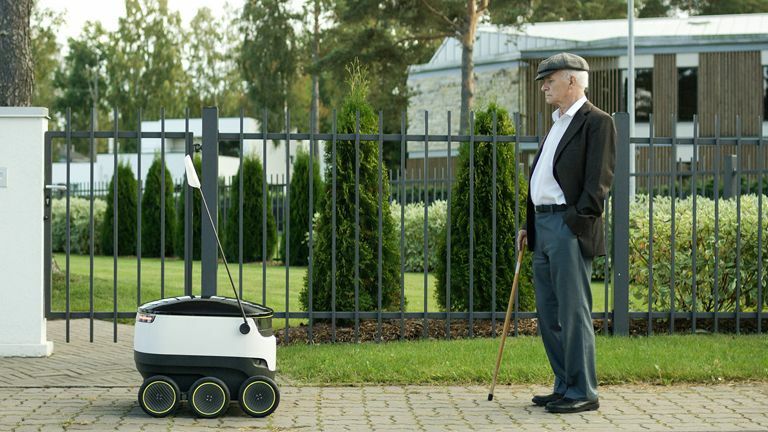 The TUG autonomous mobile robot from Aethon is designed to deliver drugs and medical supplies to hospital staff. The system, which is already in operation in numerous US hospitals, allows drugs, materials and clinical supplies to be securely transported around hospital buildings without any human interference, freeing up medical staff to look after patients.